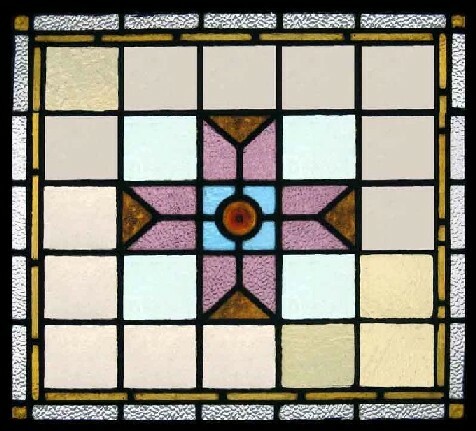 Just One Of a Huge Collection Of Stained Glass Antique Windows Available On A variety of terms. No need for the costs associated with container loads. We will hold stock until required and ship direct to your customers with full insurance. Shipping costs can be as low as US$30 per additional window after the first. Marketing assistance will also be available on stock held. Re sizing of windows to customer requirements can be undertaken at very competitive costs as part of the marketing assistance. This beautiful old window can be purchased as part of a stained glass wholesale consignment at a substantial discount. It has outlived its original frame and has been housed in a simple pine frame. It was removed from a house in Leeds during refurbishment. The colours in this window are BREATHTAKING. Circa 1901 The glass has no chips or cracks and the leading is in excellent condition. This coloured glass is of a heavy and deep texture. The frame measures 26 1/2 "W x 24 1/4 "H The glass measures 24 1/2" x 22 1/4" This Antique Window Shipped and packed to USA would be $119. including fulll Insurance You can buy this now using the Paypal link below the photograph or e-mail sales click here to arrange payment by personal check ,money order or bank transfer. Or to discuss wholesale terms.